Spain's Guardia Civil police arrested a top Catalan government official on Wednesday as part of raids on several Catalan government offices, sparking protests in Barcelona. 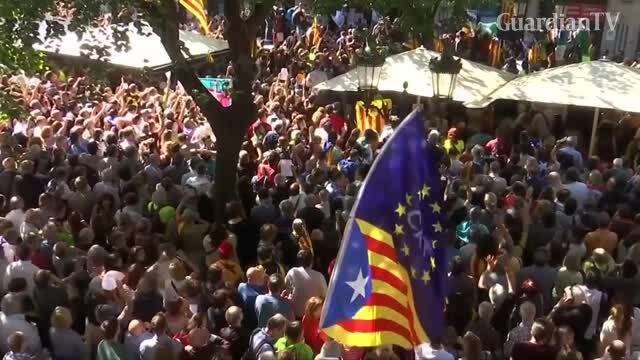 The operation comes amid mounting tensions as Catalan leaders press ahead with preparations for an independence referendum on October 1 despite Madrid's ban and a court ruling deeming it illegal. Officers arrested Josep Maria Jove, an aide to Catalan vice president Oriol Junqueras, in the operation, police and the Catalan government said. The reasons for his arrest were not immediately clear, but Spain's central government had warned that officials who help stage the referendum could face criminal charges. Several hundred protesters blocked the Gran Via, a Barcelona high street, near Jove's office, chanting "Independence" and "We will vote". Anna Sola, an unemployed 45-year-old, said she rushed to Jove's office after hearing of his arrest on the news and through text messages from friends. "They are attacking our institutions, those that we voted, just for simply doing what the people want, and without any respect," she said. "It is a shame what is happening in Catalonia, there are no words for it." Police were searching the Catalan government's offices of foreign relations and the presidency in addition to the offices of Jove's economic affairs office, a Catalan government spokesman said. The police operation comes a day after officers seized a trove of documents related to the independence referendum from the offices of Unipost, a private delivery company, in Terrasa, a city near Barcelona. Police said they confiscated over 45,000 notifications which were about to be sent to Catalans selected to staff polling stations for the vote, representing 80 percent of the numbers necessary to ensure the stations were adequately staffed. Police scuffled with dozens of pro-secession protesters who gathered outside the Unipost office to try to block officers from entering the building. The protesters placed flowers on police vehicles and sat on the street to block access to the site. Madrid has taken several steps to prevent the Catalan referendum from going forward, including threatening to arrest mayors who facilitate the vote, ordering police to seize any item that could be used for the plebiscite and tightening control over the region's finances. It says the country's constitution stipulates that a Spanish region does not have the right to call a referendum. Prime Minister Mariano Rajoy defended his government's actions, saying during a debate in parliament on Wednesday that it was "fulfilling its obligation". "The rule of law works," he added. But opinion polls show that Catalonia's roughly 7.5 million residents are divided on independence. A survey commissioned by the regional government in July showed that 49.4 percent of Catalans were against independence while 41.1 percent were in favour. But more than 70 percent of Catalans said they wanted a referendum on independence to settle the issue. If the referendum passes, Catalan officials have said they will declare independence within days. Catalonia, a wealthy region which accounts for about one-fifth of Spain's economic output, already has significant powers over matters such as education and healthcare. But Spain's economic worries, coupled with a perception that Catalonia pays more in taxes than it receives in investments and transfers from Madrid, have helped push the cause of secession.